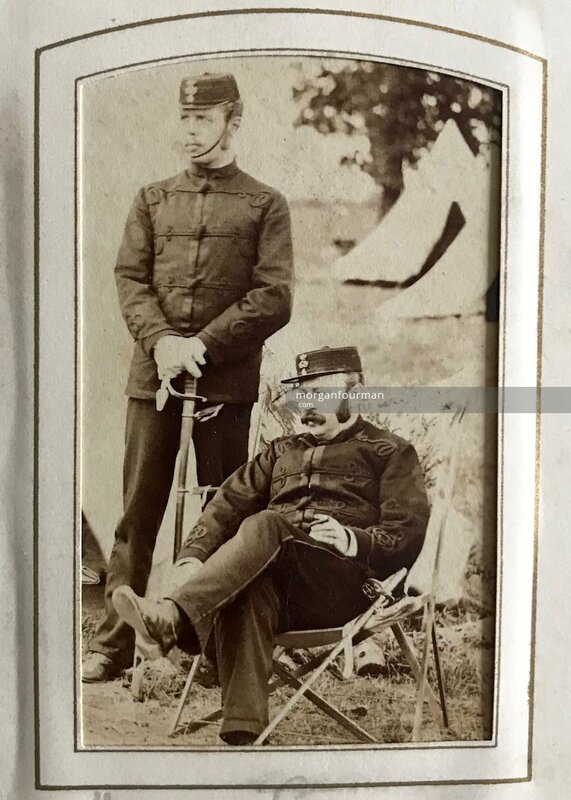 The Wolverhampton Rifle Volunteer Corps was set up in 1859 in response to the possibilities of war with France. Henry Evans and his cousin Thomas Bradney Shaw-Hellier were among the volunteers. Henry’s brother-in law Charles Richard Ogden Evans was a serving officer in the Royal Artillery and, although, not directly involved in the Volunteers, must have been a strong influence on the 20 year old Henry. Other friends of Henry also seem to be involved and we have a selection of photos of these gentleman soldiers. Originally volunteer units comprised mainly of people from the middle and professional classes and it is difficult to dispute the contention that the Volunteers had strong elements of Dad’s Army, which some 100 years later satirised the 1940’s from the viewpoint of the 1970’s. 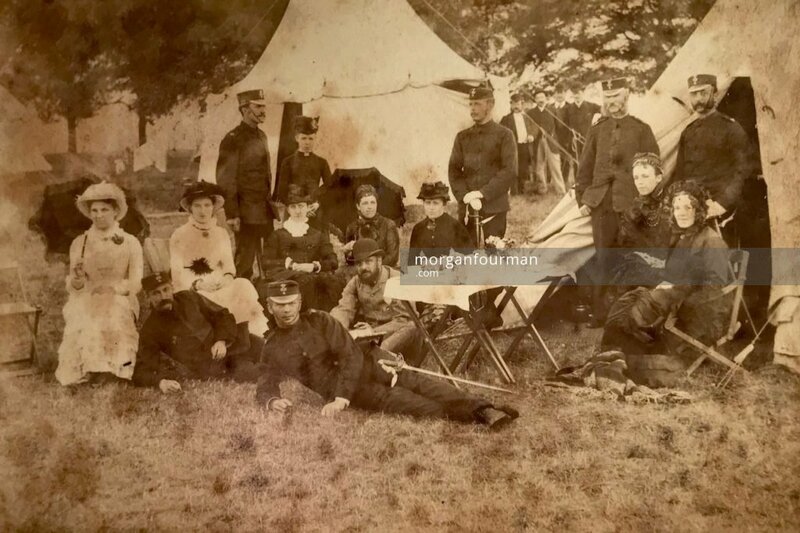 The group photos below possibly were taken during the annual encampment of the 4th Staffordshire Rifle Volunteer Corps in the park of Oxley Manor near Wolverhampton in about 1880. The mark on the side says J.Harper, Photo, Oaken, Staff. Oxley Manor was a home of Alexander Staveley Hill. The photo of Henry Evans, a slightly corpulent bank manager, seated on a chair smoking a cigar would hardly put much fear into a would-be Napoleon. Possibly it was taken at the same leisurely event in 1880. Standing next to Henry is clearly a prototype Private Pike. 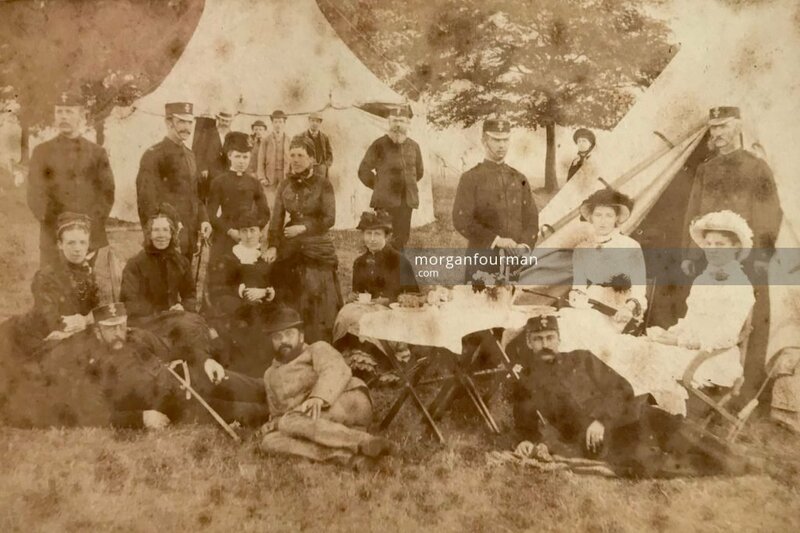 The satire is probably doubly strong that this was a force of gentlemen on a picnic, ready to fight an enemy that did not exist, in a part of the country that was far from any front line. 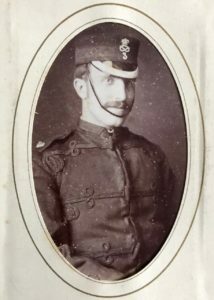 Henry Evans’ first cousin Thomas Bradney Shaw-Hellier took part in the early volunteer movement. From Sep 1860 to Aug 1861 he served as Lieutenant with 2nd Regiment of King’s Own, Staffordshire Militia. His photo at a flower bedecked window dates to slightly later period, possibly to 1863 when he joined 4th Regiment of Dragoon Guards. There are three other photos of people in uniform in Florence Marten’s Album. 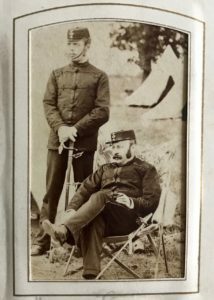 They are Captain Edward Hickman and Lieutenants Arthur M. Manby and William R. Lysaght. All three were officers of the 3rd Volunteer Battalion, South Staffordshire Regiment. The photos were taken by William Bassett, Artist and Photographer, 29 Snow Hill, Wolverhampton possibly in 1882. 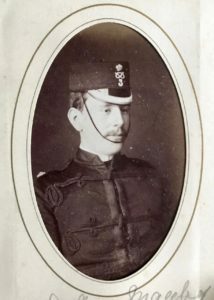 Edward Hickman almost certainly was related to the prominent Hickman family. 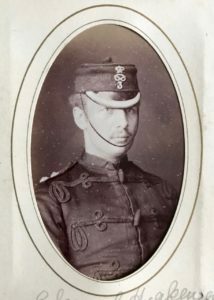 His father Sir Alfred Hickman was later to become MP for Wolverhampton and also Mayor. There is also a picture of Tom Hickman, not in uniform, in the same album. 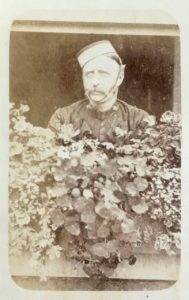 Separately we know that the early manager of Henry Evans’ bank was James Forsyth, dubbed ‘General’ in another of the surviving photos. In 1889 most people mentioned above were among the guests at Henry Evans’ wedding. In 1910 his only son Wilmot Evans joined the regular army as an officer in the South Staffordshire regiment.